Here we are at the high energy moon in Aries. It's an active energy, a warrior energy. Aries is traditionally thought of as a masculine sign. But this full moon's ruler, Mars, is paired with feminine Venus in the sign of Virgo, the maiden. So I began researching female warriors and I landed on Queen Boudica. 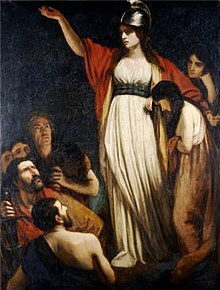 Boudica (also spelled Boadicea, Boadaceia, and other ways) was a queen of the Celtic Briton Iceni tribe in the region of modern day Norfolk when Britain was ruled by the Roman Empire. Her husband, Prasutagus, left his kingdom jointly to his two daughters and the Roman Emperor in his will when he died. Prasutagus had ruled as a more or less independent ally of the Empire, but after his death the Romans ignored the will and annexed the kingdom. According to the Roman historian Tacitus, soldiers flogged Boudica and raped her two young daughters in front of her. In AD 60 or 61, Queen Boudica led the Iceni and other tribes in a massive uprising against Rome. Tacitus records that she addressed her army with the words, "It is not as a woman descended from noble ancestry, but as one of the people that I am avenging lost freedom, my scourged body, the outraged chastity of my daughters." Her troops destroyed the Roman settlement of Camulodunum (modern day Colchester), forced the Romans to evacuate Londinium (modern day London), and then burned both Londinium and Verulamium (modern day St. Albans). Boudica's rebellion made Nero consider withdrawing from Britain. Eventually, though, the Romans defeated the Britons, and Boudica either killed herself to avoid capture or died of illness. 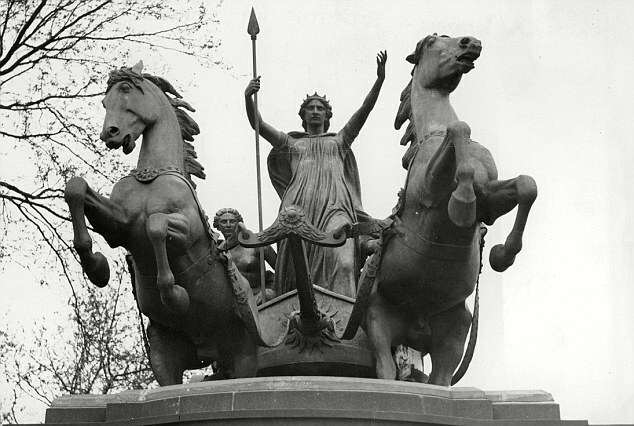 There is a sculpture of Boadicea and Her Daughters leading the charge to battle in their chariot at the Westminster Bridge in London. 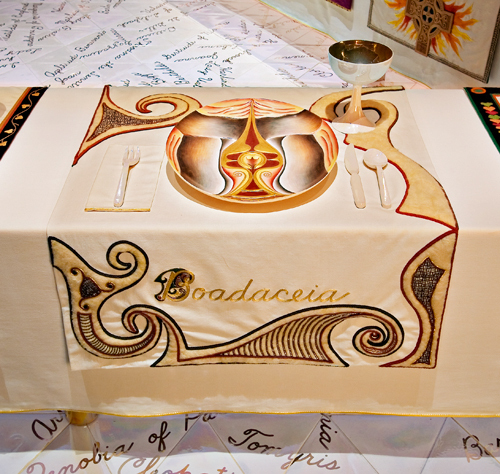 Judy Chicago made a place setting for Boadicea in her installation The Dinner Party. Boudica has remained a popular folk hero, inspiring novels and at least one movie. She is often cited as a famous warrior queen. So maybe you've heard of her, especially if you're British. But until yesterday, despite taking four years of Latin that included some fairly comprehensive Roman history, I hadn't. I suspect others haven't either. We often tell the stories of famous warriors. For example (in no particular order): Napoleon, Alexander the Great, Julius Caesar, Richard the Lionheart, Attila the Hun, Spartacus. The queens and the warrior women are less well known. At this full moon, I invite you to embrace that energy of courage, leadership, and righteous aggression. Not that you're going to burn down any cities. But there is power in unearthing a history of women's sovereignty. There is power in welcoming the assertive energy of your own Mars. There is power, when necessary, in allowing your warrior energy to flow through you. Where is Mars in your chart? This tells you something about your own way of asserting yourself. Mars reveals what drives you and what pisses you off. When you read about your Mars position by sign or house, do you loathe that part of yourself or celebrate it? Somewhere in your chart, there is the potential for a warrior queen. I encourage you to find her. Thoughts? Questions? Feel free to comment below.